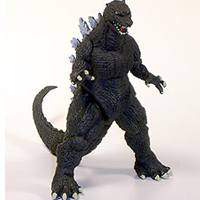 Gamera 3 the Guardian of the Universe 1999 Incomplete Struggle is one of the best Kaiju Movies of the genre. It was directed by Kaneko Shusuke: the director of the previous 2 Gmaera movies in the Gamera Trilogy. This is a Theater Exclusive item: meaning it was only available as some of the movie theaters in Japan during the showing of the film in 1999. The program has 25 full color pages of action photos from the movie, behind the scenes, and cast information (in Japanese). This is a must have for FANS! Scroll down to see additional photos. From the exciting 1996 Movie "GAMERA GUARDIAN OF THE UNIVERSE", this is the Theater Exclusive Medallion! This solid metal medallion is a wonderful "Memory Saver" with SNARLING Gamera on the front and a Super Deformed style Gamera on the back. These Medallions are hard to come by even in Tokyo! Comes in Plastic display case (case has small crack on the front right side). We only have one of these available! GO GAMERA! From the exciting new Gamera Movie "Little Braves", this is the Theater Exclusive Movie Program. It is a wonderful "Memory Saver" that features many photos from the new movie as well as older photos of Gamera's earlier battles. Done in a "retro" style, this program features a double fold out that shows a map of Japan with locations of past Gamera Battles as well as fold out diagrams showing the inner workings of both Gamera and his new Monster Foe Jidas! This Theater Exclusive Program has 25 action packed pages. Dimensions approx. 12 by 8 inches. We have a very limited supply available! All your little Gamera Fans will love scribbling in this notebook with a 3 dimensional POP UP of Gamera Battling Jidas From the exciting new Gamera Move "Little Braves", this is the Theater Exclusive 40th Anniversary Pop Up Note Book. It contains 25 lined pages for notes! We have a very limited supply available! 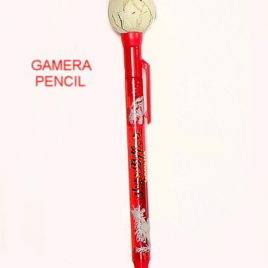 From the exciting new Gamera Movie "Little Braves", this is the Theater Exclusive 40th anniversary Pencil. This wonderful pencil features a hatching Gamera inside his egg shell on top. Each time you click the pencil to extend the lead for writing, the Gamera Hatchling goes down into his egg! This is a "Memory Saver" from the new movie and also a fully functioning mechanical pencil. We have a very limited supply available! This is now a VERY RARE poster. All of the "artwork" style posters designed by Orai are extremely collectible and very hard to find. This is Gamera 2 ADVENT OF LEGION 1996 ARTWORK STYLE ONE SHEET Approx. 20 1/2 by 28 1/2 inches. A DRAMATIC and Beautiful Poster in NEAR Mint condition.